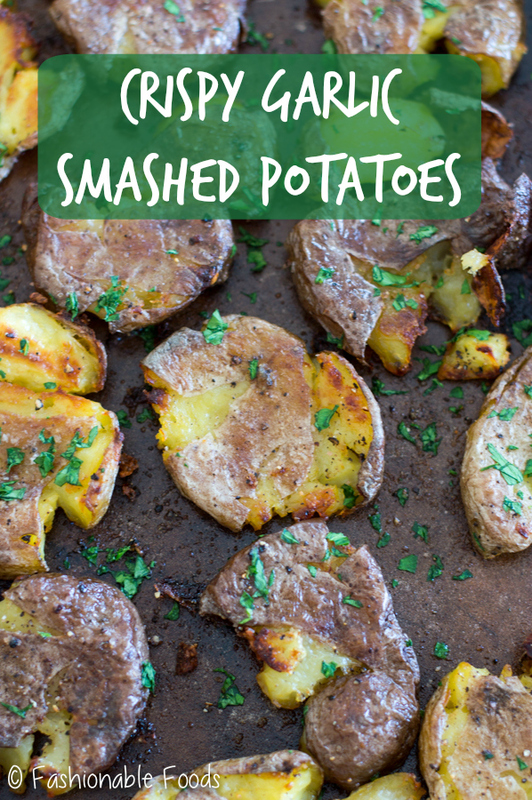 Get ready for the best side dish ever – crispy garlic smashed potatoes. 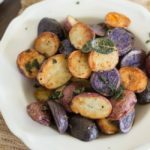 Not only are these potatoes simple, but they are crispy on the outside, creamy on the inside, and full of flavor. **This recipe was originally posted in March of 2014. 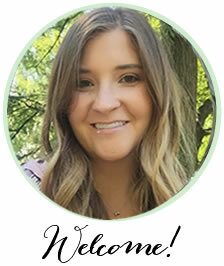 It was time the photos get a much-needed update! 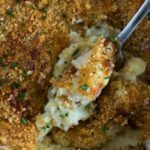 Potatoes are definitely one of the most versatile foods out there. You can boil them, roast them, fry them, steam them, mash them, and well, you get the point. As I’m sure I have mentioned before, I love potatoes in all forms. There isn’t much a good ‘ole potato doesn’t pair well with. One bite of these crispy garlic smashed potatoes and you’re life will be changed forever. <– I’m dramatic, I know. 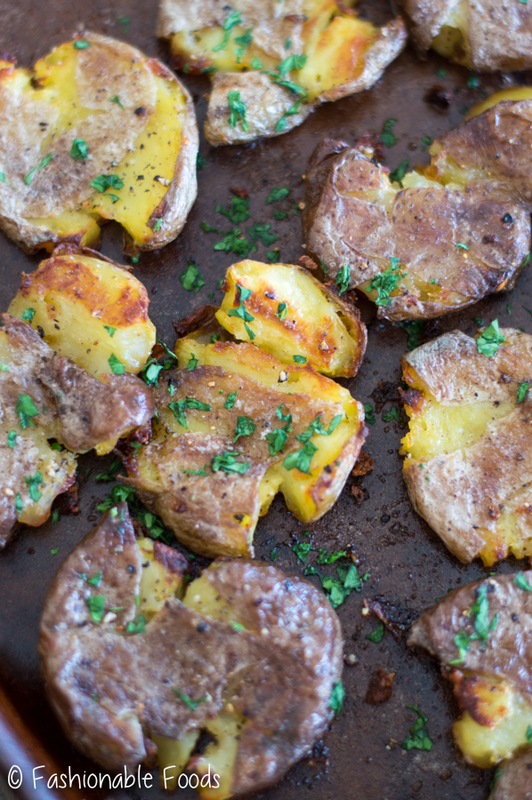 But seriously, these potatoes are LIFE-CHANGING. I would describe these as a cross between a roasted potato and a baked potato. I use small or medium potatoes and gently smash them with the back of a spoon, season them up, and roast them. Very simple! 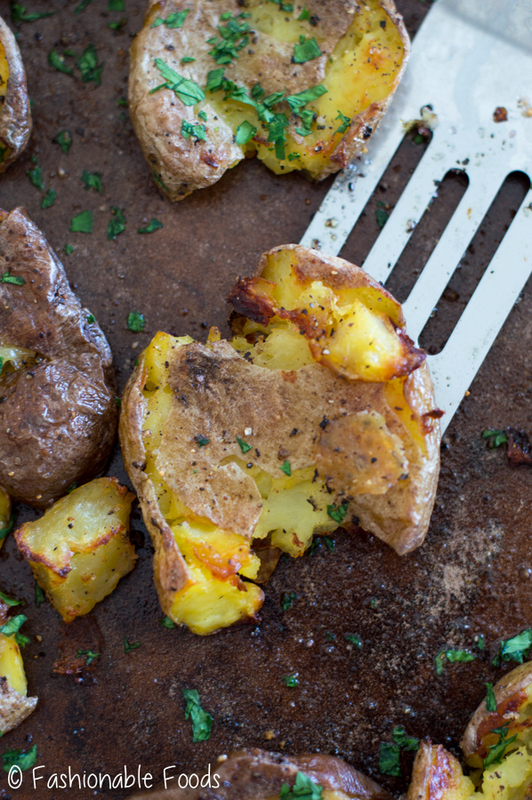 Crispy on the outside and fluffy on the inside, these potatoes are simple and delicious. 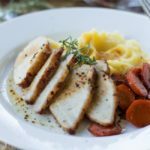 I like easy side dishes that don’t require a lot of ingredients, and this one fits the bill at only 5 ingredients (7 if you count the salt and pepper). Potatoes, salt, pepper, olive oil, butter or ghee, garlic, and parsley; I don’t know about you, but I always have those on hand! With just a few steps, you’ll be in potato heaven. 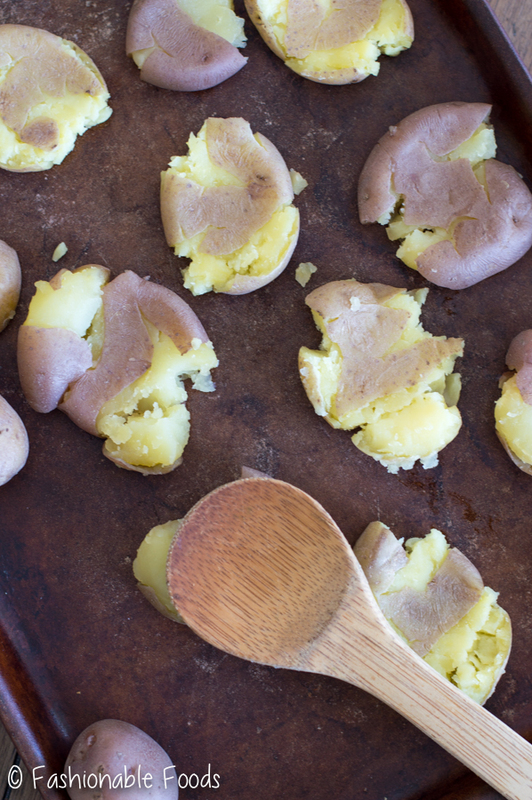 Boil baby potatoes for 12-ish minutes, until they pierce easily with a pairing knife. Smash them with the back of a spoon and season with olive oil, salt, and pepper. Roast a small head of garlic alongside the potatoes. Roast ’em until crispy (about 30 minutes). Squeeze the roasted garlic into a bowl with some ghee or butter and let it melt. Brush the potatoes with that mixture and top everything off with parsley. There isn’t much more I can say about these as they pretty much speak for themselves. Simple food at its best! 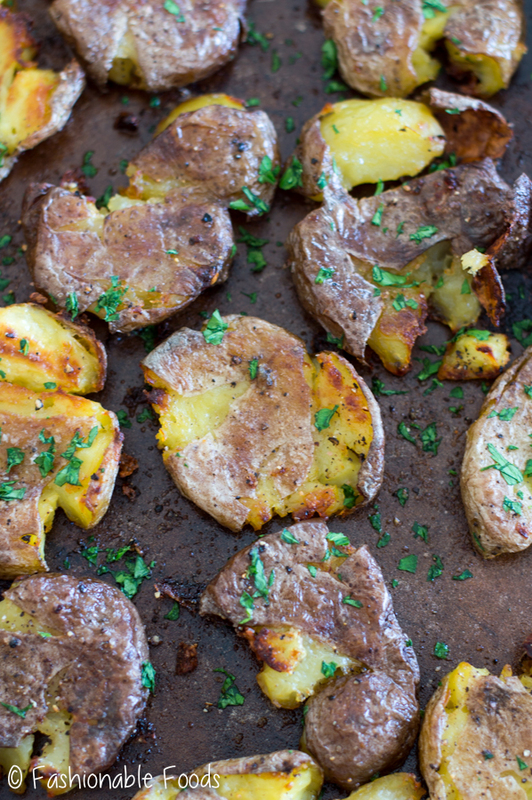 Crispy on the outside and fluffy on the inside these potatoes are a fantastic side. Not only are these a simple side, but they are full of flavor! 1 Tablespoon Melted Ghee or Butter*, or use extra-virgin olive oil to make these vegan! Place the potatoes in a large pot and cover with cold water, and add a teaspoon of salt. Bring to a boil and cook the potatoes uncovered in the boiling water for 12 minutes, or until pierced easily with a fork. 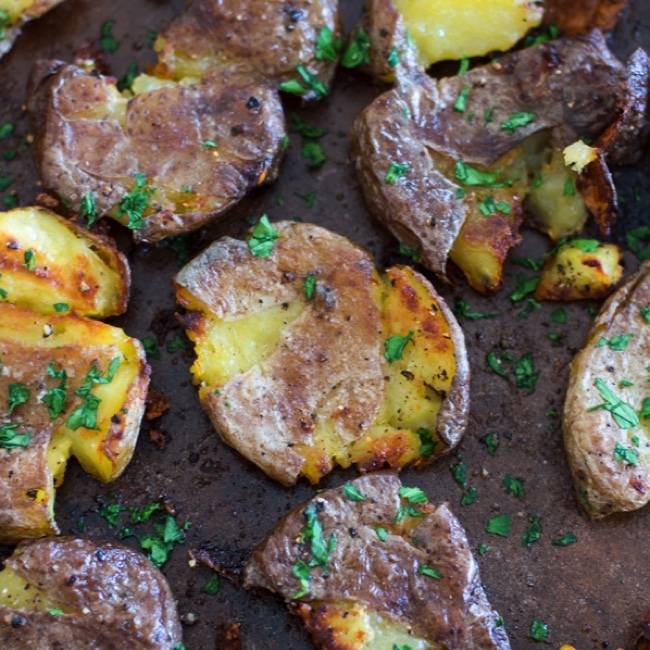 Drain and lay the hot potatoes out on a cutting board. Using the back of a wooden spoon, very gently press the potatoes. You don’t want to completely crush or mash the potato; you’re looking for cracked potatoes that still hold together. 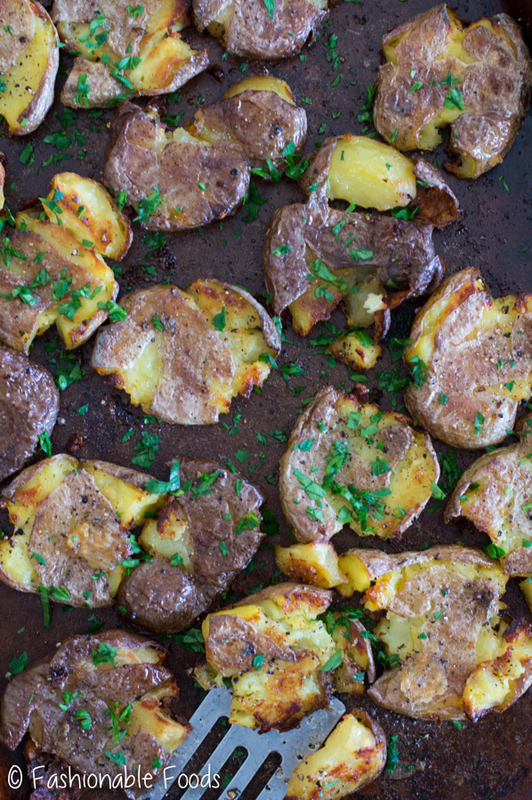 Gently place the potatoes and the head of garlic onto a baking sheet. Drizzle everything liberally with olive oil and season with salt and pepper. 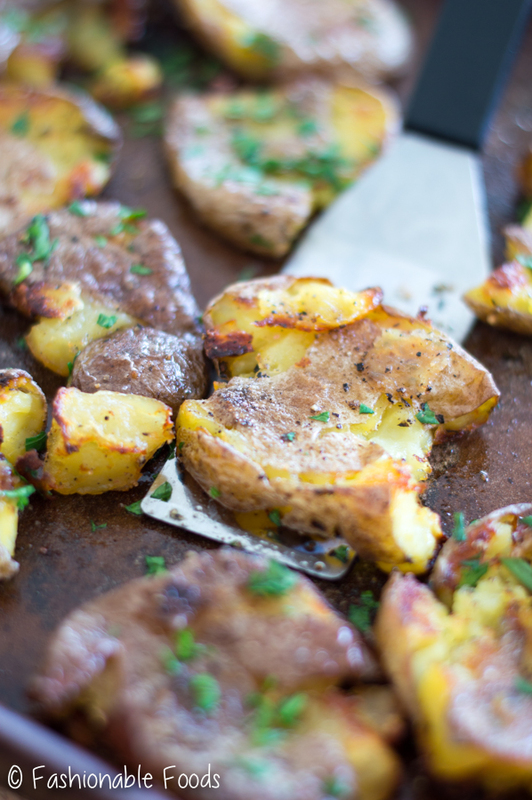 Bake the potatoes at 425º for 25-30 minutes, or until the potatoes are deep golden brown and edges are crisp. Squeeze the roasted garlic into a bowl with melted ghee (or butter) and brush the mixture over the potatoes. Sprinkle with parsley and serve. *Using ghee makes these Whole30 compliant.